This was an amazing...no, bewildering...no, outrageous...um, indescribable sight. 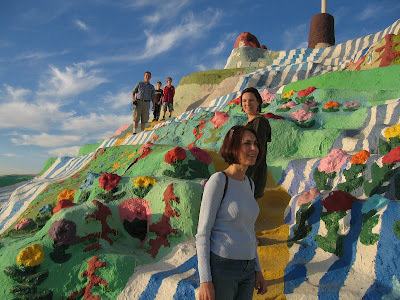 This man-made mountain, located just outside Niland, CA, was constructed out of adobe and painted with myriad colors. The builder/artist, Leonard Knight, wanted to create a visual display of "outsider art" which includes Bible verses, the sinner's prayer and the Lord's prayer. 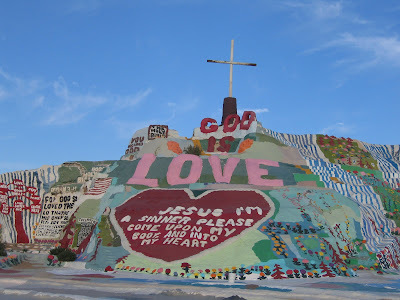 He continues to add on to the mountain, constructing "caves" and walk-throughs which are also painted and exhibit his theme of "God is Love". 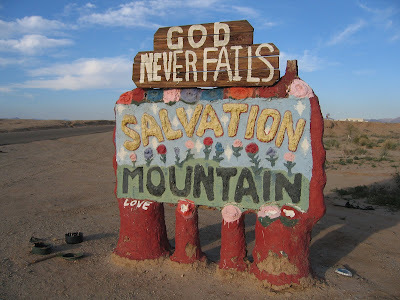 Visit his website, http://www.salvationmountain.us/ if you're interested in seeing more of his work. Our group was on the "golden road" up the mountain to catch a spectacular view of the sunset. 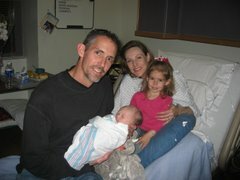 Father and son...a sweet moment. 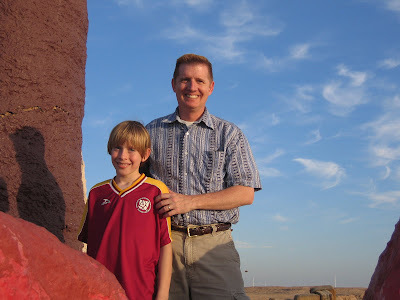 We went to look at "art" but found ourselves marveling at God's brilliant display of His own designs: the clouds look whispery and ideally painted on a canvas of blue, the sunset reflecting colors of orange, yellow and pink on our faces. Now that's beautiful! 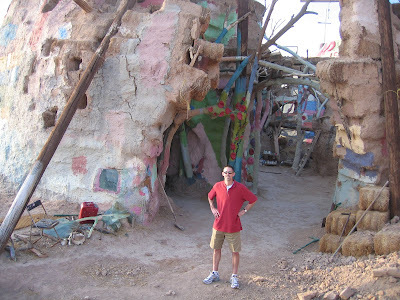 This a full view of the original Salvation Mountain; the newest additions are off to the right and pictured below with Jay. You can see how Leonard builds his caves. He literally uses wood, hay and stubble as the foundation for his walls and then paints over them. And you can witness the frailty of such resources as they have tried to keep walls from cracking and crumbling. What excellent imagery for I Corinthians 3:12-13, "Now if any man builds on the foundation with gold, silver, precious stones, wood, hay, straw, each man's work will become evident..."
What an incredible way to witness! Loved it! That sure is an interesting sight. There are no adequate words to describe it, I'm sure. Do you have to pay to visit it? I wonder how many people visit per year and if it has been used of God to bring anyone to salvation. I am sure most people think it's a crazy idea from a crazy guy. I am glad you shared this with us. It might be an interesting thing to go see with the girls when we are home on furlough.